A picture is worth a thousand words. But what do you do when you have more than a thousand pictures? Click here to get a link to the download page. 4) The client runs the software to view and select and comment on the images. 5) The client pushes a button and the program sends you the com file (small, less than 1mb). 7) You can see the client's selected images, and comments. 8) You can then use Image Viewer to move the files the client selected (or files corresponding to the selected images, like maybe the digital negatives) to an appropriate folder so you can work on them. It doesn't matter if you use a Mac and your client uses a Windows machine (or the other way around). We've even got Linux covered. Why not download the free demo? If you like the demo, I could sure use your feedback on the Studio download also. Thanks very much for your time and your support. The task: The honeymoon is over and the bride and groom have to sort through 1400 images from their wedding and communicate, clearly and concisely to their photographer, which shots they want in the album, which in the slideshow, and which they want for the collage. To make them write it all down and then have the photographer translate that writing into some error-free action  difficult if not just time-consuming. And to require them to do it through a slow internet connection with a not-so-powerful computer is asking for trouble. Image Viewer is available for both Windows, Macintosh and Linux. It is a unique solution, which your clients can run on their home computer, which requires simple use of keyboard or mouse, to make selections. One click transmits the small file containing those selectios over the internet to the photographer. Note: the client doesn't need an email program or even an email account because Image Viewer communicates directly with the photographer's email server -- it's one mouse-click for the client to send this file. The photographer then knows exactly what the selections are and is able to transfer and manipulate the files without any misunderstandings. Files aren’t sent  only file names  and thus the speed and ease. The photographer is able to use the transmitted selection file to drive workflow actions such as separating the files the client has selected into a separate folder. Click here for detailed workflow. The flexible interface Image Viewer uses allows the clients to noodle their way through the selection process in whichever manner they choose. If they wish, they can discard the losers, or go through multiple steps of sifting until arriving at their final choices. They can keep selections from each pass to go back and rethink the selections, or do it all in one step  the choice is theirs. And they can now add comments to the images. Getting back a selection file with comments is like having the client right there pointing out what they want and don't want. 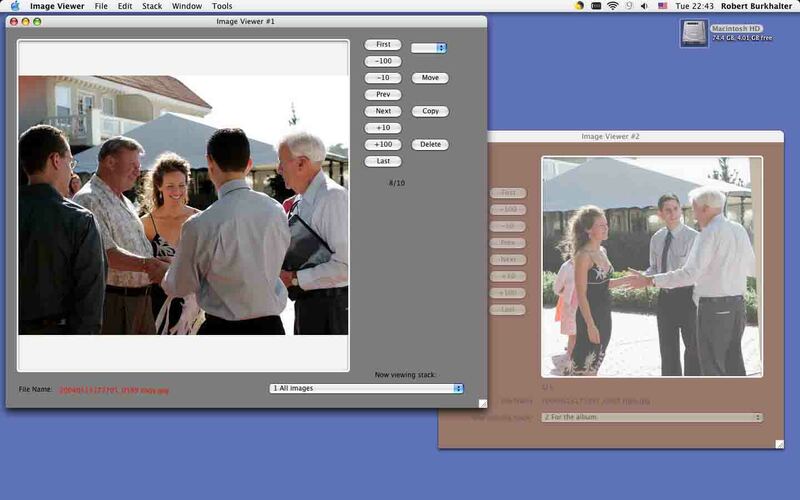 When your clients use Image Viewer during the proofing process, the difficult task of image selection becomes what it ought to be  made easier by computer. Because your clients don't have to jot down file names and then you have to read (and possibly mis-read) what they've written, the process is more efficient and concise. And Image Viewer can actually provide better security for the images (they can be watermarked and/ or simple-scrambled to prevent unauthroized clipping and printing by the client). Take it for a spin with a no-risk trial. When you get a link to the download page you can download either the Demo (so you can experiene what your clients will) or the Studio version with installation instructions and full documentation sources so you can tailor them for your clients. Note: Even though this was designed to handle the more-than-2000 image wedding shoot delivered on a CD, we're finding great success using Stuffit to compress 300 shots from a portrait shoot, and then the great free service called dropload to wisk it across town in a matter of miinutes to the client for total digital delivery. Note: I would suggest using jpegs with about 700 pixels on their long side with 5 quality. Image Viewer will handle huge jpegs, but scaling of the display can burden a slow machine -- try whatever size you think is right for your cllient's computer. Let me know if there is something I can do to make this program better for you and your clients. My intention is to modify this program to do whatever you need it to do to help you with your business and your cllients. So don't hesitate to let me know exactly what you need.